The index opened huge gap-up around 8077 and stayed in a narrow range of 20-25 points for the better part of the day, only to see breakout to close near the top at 8090.45, huge gain of 62.85 points. The broader market was also positive, with 866 advances to 656 declines. Expiry range has come down to 8030-8140. Call option 8150 added huge 5.78 lacs OI with short covering seen at 8050 and below strike prices. Put option 8150-8000 added huge 33.94 lacs OI with profit booking seen at 7900 and below strike prices. Nifty Open Interest is at 1,21,24,500 down by 15,21,250, whereas Nov series added 47.05 lacs with increase in price, probably 100% roll-over with huge long addition. Bank Nifty Open Interest is at 13,73,000 down 2,45,125, whereas Nov series added 2.41 lacs with decrease in price, probably 100% roll-over with small long liquidation. FII’s bought huge 26.46 lacs Futures, which includes 45086 contracts long build-up and 7834 contracts short covering, with increase in net OI by 37252 contracts (includes 169524 longs to 116604 shorts for the day) and the average price per contract comes to around 8152.89. FII’s Index future open contract as on date is 375225 Longs to 119420 Shorts, net long 255805 up by 52920 contracts. Initial support now at 8050, with huge OI addition of 18.14 lacs and below that at 8000 with huge OI of 57.59 lacs. Initial and best resistance still at 8100, with highest OI of 60.41 lacs and above that at 8200 with huge OI of 52.58 lacs. Day Range as per Option Table is 8024 - 8141 and as per VIX is 8035 - 8146 with 8080 as the Pivot. The index opened up above 8000 and stayed positive for the entire session of trade and closed nearer to the top at 8027.60, gain of 35.90 points. The broader market was also positive, with 825 advances to 686 declines. The series range is still at 8000-8100. Call option 8400 added huge 5.42 lacs OI with short covering seen at 8000 and below strike prices. Put option 8050-8000 added huge 12.47 lacs OI with profit booking seen at 7900 and below strike prices. Nifty Open Interest is at 1,36,45,750 down by 23,19,200, whereas Nov series added 56.82 lacs with increase in price, probably 100% roll-over with huge long addition. Bank Nifty Open Interest is at 16,18,125 down 1,37,700, whereas Nov series added 3.71 lacs with increase in price, probably 100% roll-over with huge long build-up. FII’s bought huge 7.13 lacs Futures, which includes 41593 contracts long build-up and 27338 contracts short build-up, with increase in net OI by 68931 contracts (includes 172535 longs to 158280 shorts for the day) and the average price per contract comes to around 8109.59. FII’s Index future open contract as on date is 330139 Longs to 127254 Shorts, net long 202885 up by 14255 contracts. Initial and best support at 8000, with huge OI of 56.28 lacs and below that at 7900 with OI of 49.59 lacs. Initial and best resistance at 8100, with highest OI of 64.90 lacs and above that at 8200 with huge OI of 53.97 lacs. 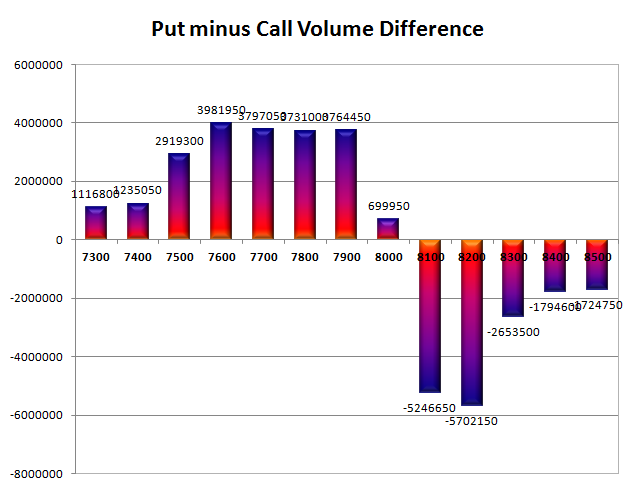 Day Range as per Option Table is 7962 - 8085 and as per VIX is 7972 - 8084 with 8020 as the Pivot. The index opened up at the highs of the day around 8064 but was sold off and closed near the lows of the day at 7991.70, loss of 22.85 points. The broader market was also weak, with 621 advances to 940 declines. The series range is still at 7900-8100. Call option 8000-8100 added huge 9.38 lacs OI with profit booking seen at 8200 and above strike prices. Put option 8000 added 0.57 lacs OI with profit booking seen at 7900 and below strike prices. Nifty Open Interest is at 1,59,64,950 down by 9,94,500, whereas Nov series added 15.9 lacs with small decrease in price, probably 100% roll-over with huge short addition. Bank Nifty Open Interest is at 17,55,825 down 1,45,350, whereas Nov series added 3.22 lacs with increase in price, probably 100% roll-over with huge long build-up. FII’s bought huge 8.41 lacs Futures, which includes 23503 contracts long build-up and 6674 contracts short build-up, with increase in net OI by 30177 contracts (includes 80083 longs to 63254 shorts for the day) and the average price per contract comes to around 8053.78. 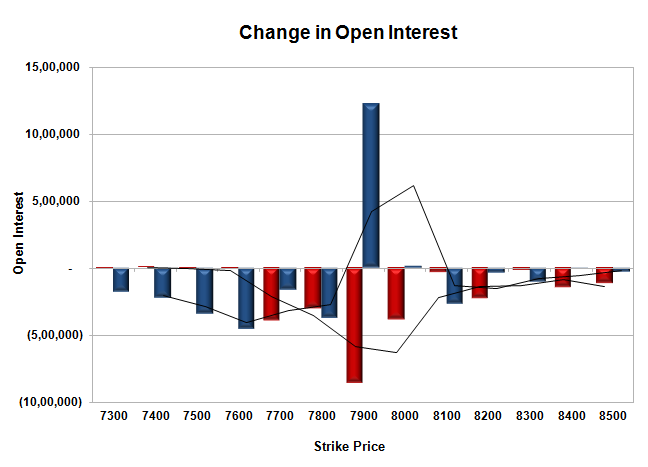 FII’s Index future open contract as on date is 288546 Longs to 99916 Shorts, net long 188630 up by 16829 contracts. 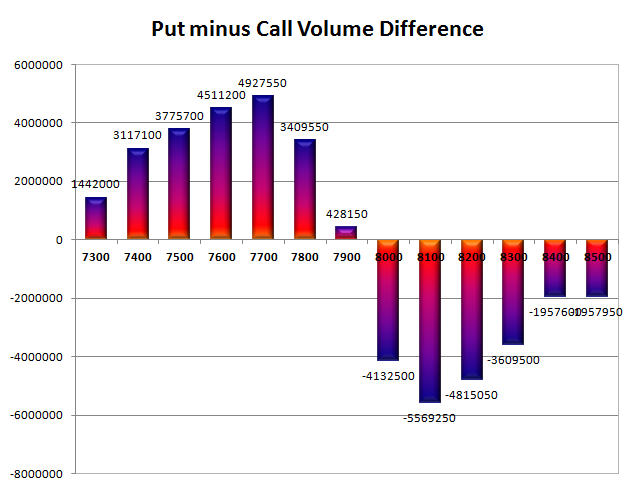 Initial and best support at 7900, with huge OI of 57.55 lacs and below that at 7800 with OI of 45.87 lacs. Initial and best resistance at 8100, with highest OI of 70.51 lacs and above that at 8200 with huge OI of 55.93 lacs. 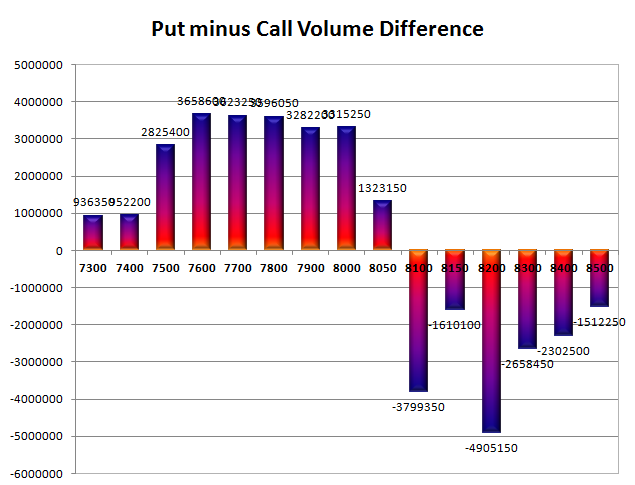 Day Range as per Option Table is 7943 - 8071 and as per VIX is 7935 - 8048 with 8014 as the Pivot. The index opened up by around 32 points on Mahurat Trading day and then stayed in a narrow range of 23 points and closed at 8014.55, gain of 18.65 points. The broader market was just positive, with 1193 advances to 255 declines. The series range is still at 7900-8100. 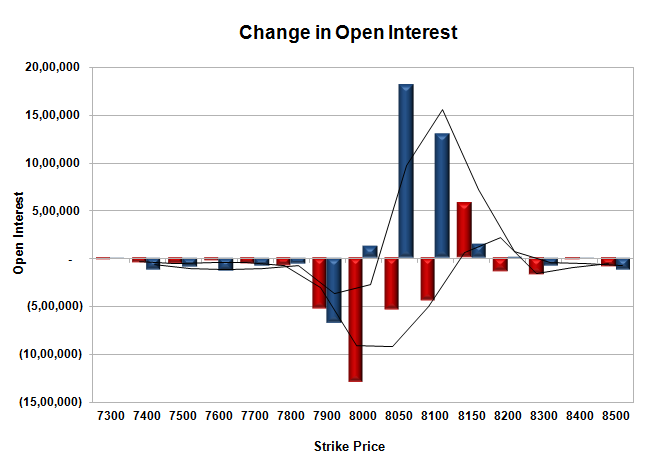 No Call option added OI with short covering seen at 7900 and below strike prices. Put option 8100-8000 added huge 5.01 lacs OI with profit booking seen at 7800 and below strike prices. 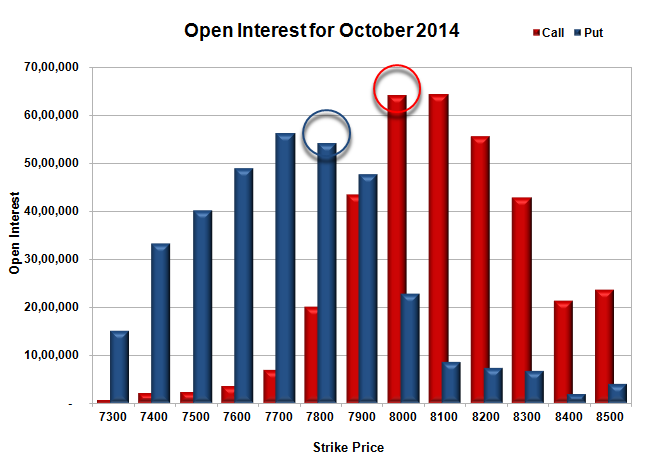 Nifty Open Interest is at 1,69,59,450 down by 1,47,250, with increase in price, probably huge short covering. 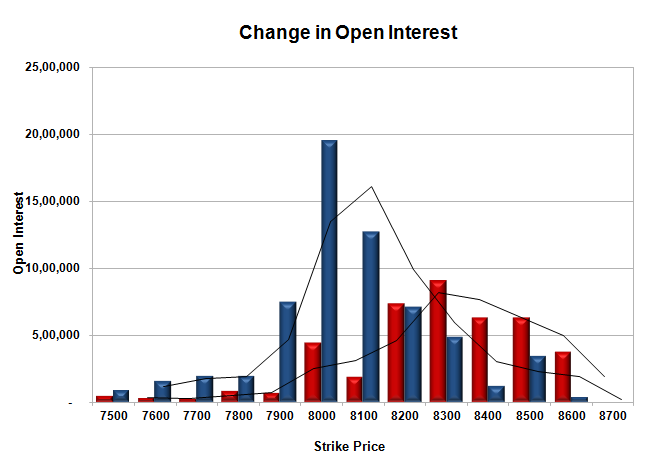 Bank Nifty Open Interest is at 19,01,175 up 28,600, with small increase in price, probably long build-up. FII’s bought 100 Futures, which includes 219 contracts long build-up and 217 contracts short build-up, with increase in net OI by 2 contracts (includes 413 longs to 411 shorts for the day) and the average price per contract comes to around 8062.42. 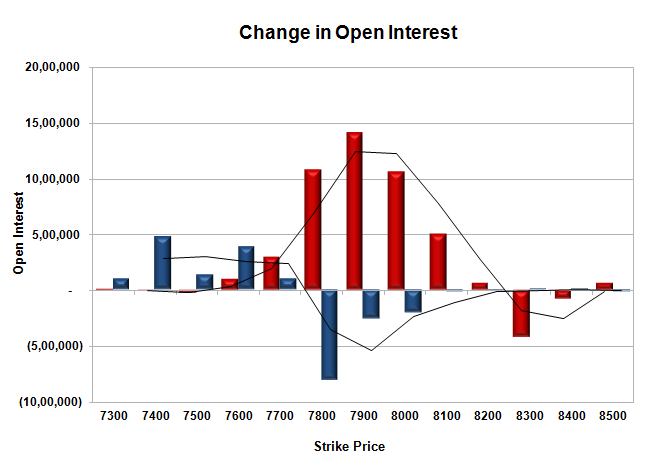 FII’s Index future open contract as on date is 265043 Longs to 93242 Shorts, net long 171801 up by 2 contracts. Initial support at 8000, with huge OI of 49.78 lacs and below that at 7900 with huge OI of 59.90 lacs. Initial and best resistance at 8100, with highest OI of 63.79 lacs and above that at 8200 with huge OI of 61.46 lacs. 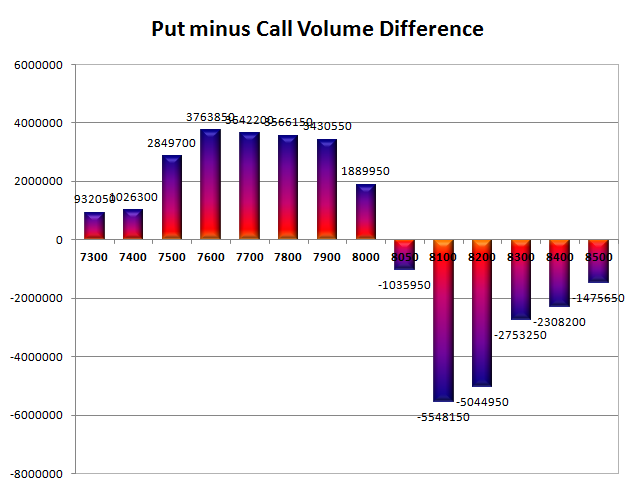 Day Range as per Option Table is 7951 - 8085 and as per VIX is 7961 - 8068 with 8018 as the Pivot. The index opened up by around 70 points and then stayed in a narrow range of 30 points but closed near the top at 7995.90, gain of 68.15 points. The broader market was just positive, with 1003 advances to 501 declines. The series range has narrowed down to 7900-8100. 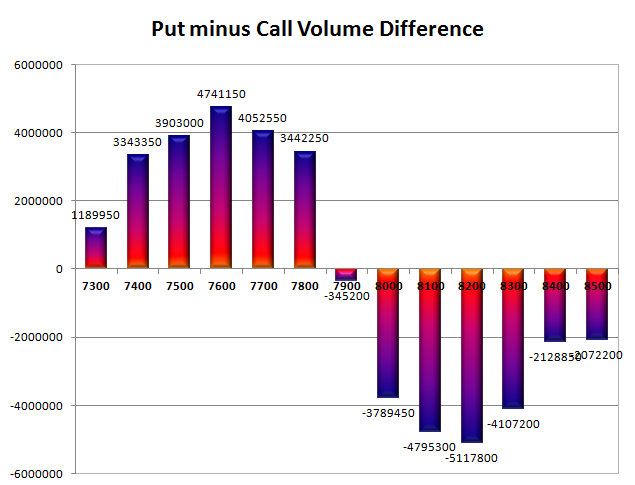 Call option 8100-8200 added 8.63 lacs OI with short covering seen at 8000 and below strike prices. Put option 8100-8000 added huge 25.37 lacs OI with profit booking seen at 7800 and below strike prices. Nifty Open Interest is at 1,71,06,700 up by 3,15,800, with increase in price, probably huge long build-up. 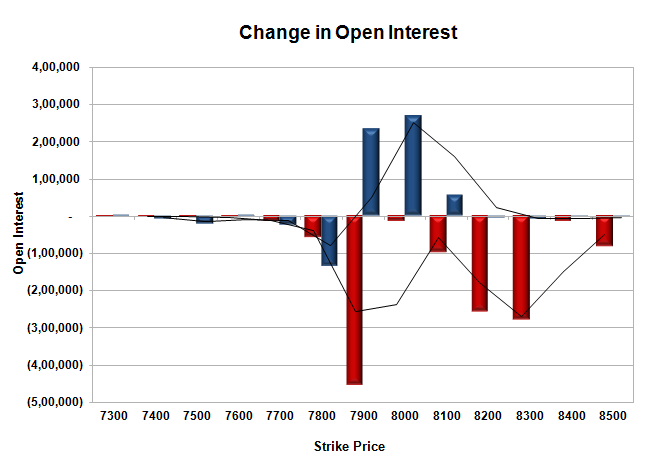 Bank Nifty Open Interest is at 18,72,575 down 86,475, with small increase in price, probably huge long liquidation. FII’s bought huge 9.34 lacs Futures, which includes 24633 contracts long build-up and 5950 contracts short build-up, with increase in net OI by 18683 contracts (includes 58145 longs to 39462 shorts for the day) and the average price per contract comes to around 8053.67. 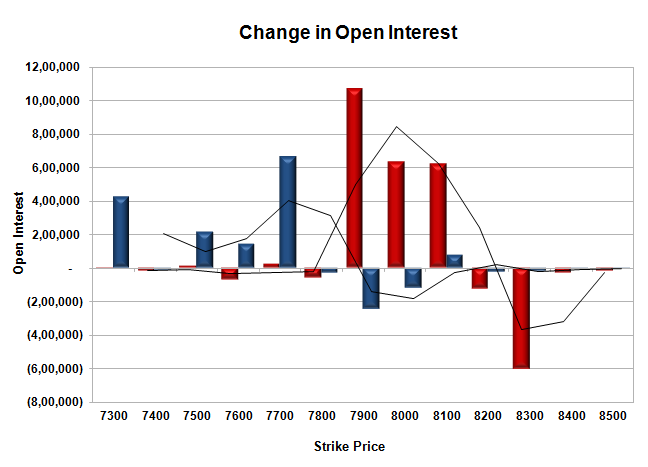 FII’s Index future open contract as on date is 264824 Longs to 93025 Shorts, net long 171799 up by 18683 contracts. 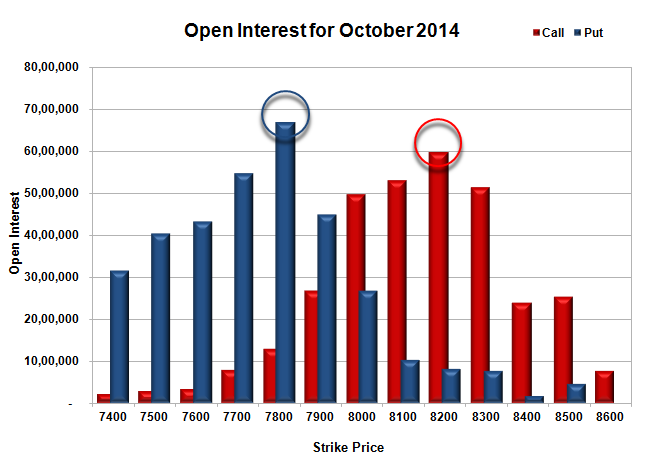 Initial support at 8000, with huge OI of 47.10 lacs and below that at 7900 with OI of 57.57 lacs. 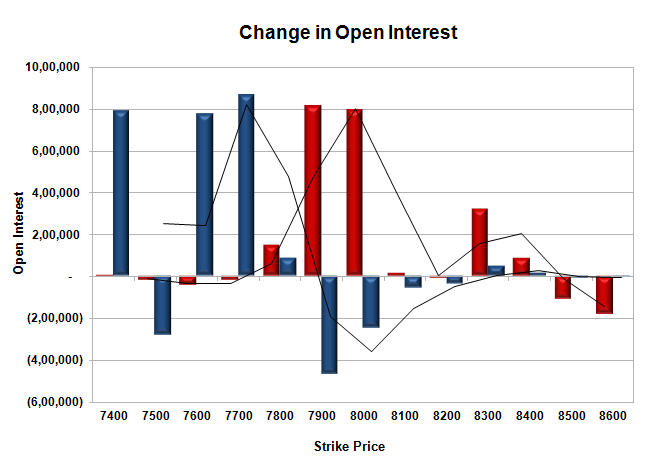 Initial and best resistance at 8100, with highest OI of 64.78 lacs and above that at 8200 with huge OI of 64.04 lacs. Day Range as per Option Table is 7920 - 8066 and as per VIX is 7941 - 8050 with 7992 as the Pivot. The index opened weak around 7734 and after staying flat for the first 2 hours saw a dip towards the lows of the day at 7724. The responsive buyer took control from thereon to move the index back in green and to the highs of the day around 7819 but closed just below at 7779.70, gain of 31.50 points. The broader market though was weak, with 711 advances to 826 declines. The series range for the time being still at 7700-8000. Call option 7900-8100 added huge 23.16 lacs OI with profit booking seen at 8200 and above strike prices. 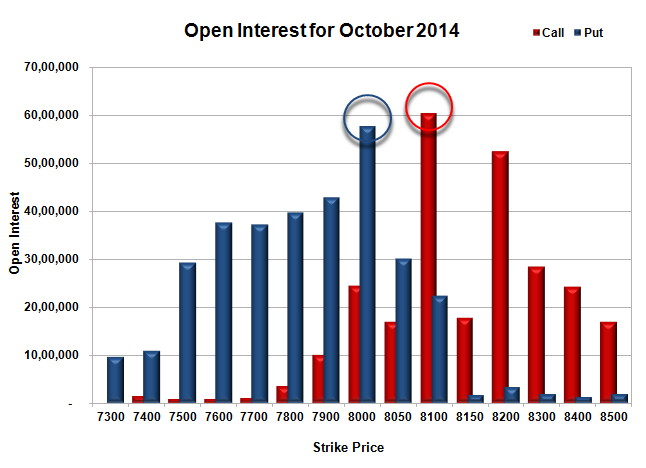 Put option 7700-7300 added huge 14.34 lacs OI with short covering seen at 7900 and above strike prices. 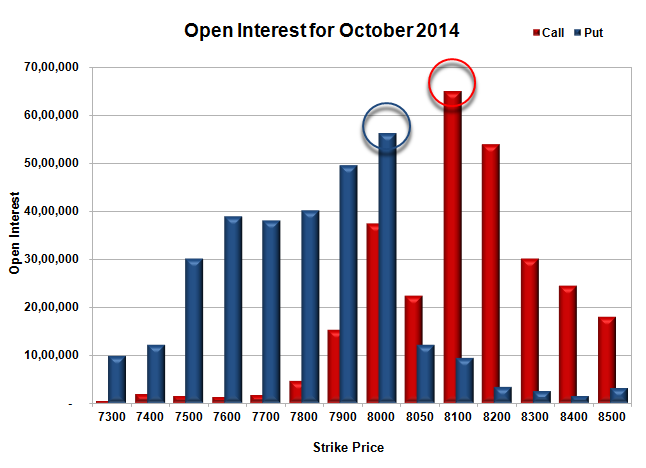 Nifty Open Interest is at 1,56,46,900 up by 12,05,700, with increase in price, probably huge long build-up. 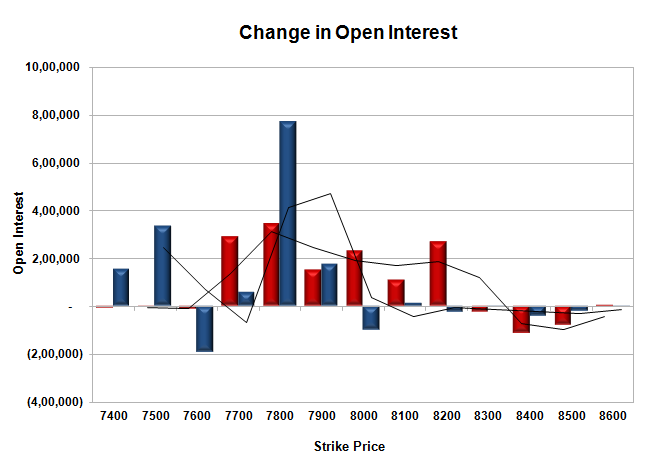 Bank Nifty Open Interest is at 17,56,675 up 1,49,275, with increase in price, probably huge long build-up. FII’s bought huge 13.16 lacs Futures, which includes 27480 contracts long build-up and 1163 contracts short build-up, with increase in net OI by 28643 contracts (includes 76740 longs to 50423 shorts for the day) and the average price per contract comes to around 7844.72. 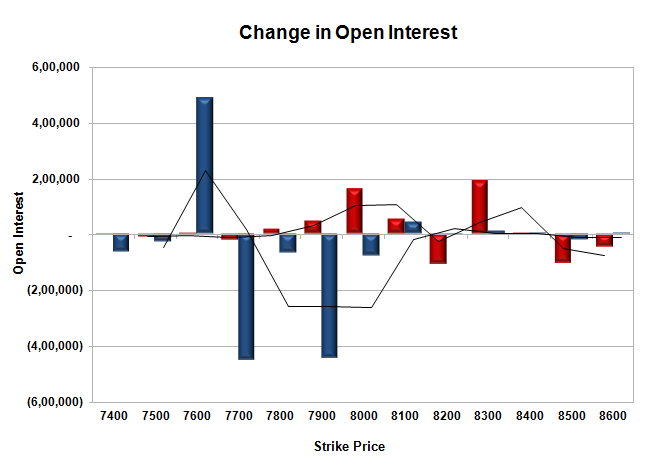 FII’s Index future open contract as on date is 180547 Longs to 74046 Shorts, net long 106501 up by 26317 contracts. 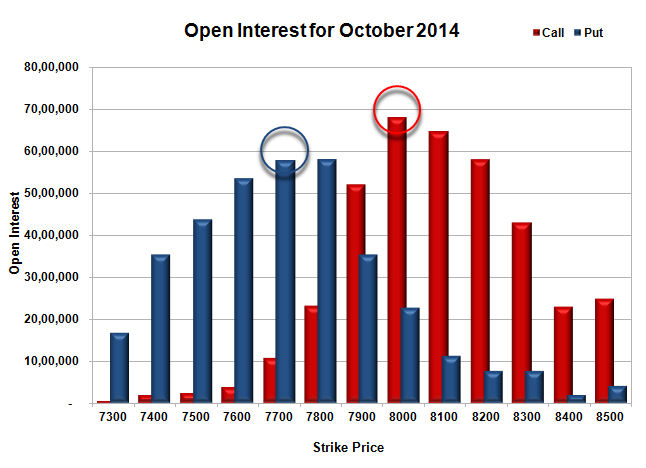 Initial and best support still at 7700, with huge OI of 57.84 lacs and below that at 7600 with OI of 53.44 lacs. Initial resistance at 7900, with huge OI of 52.07 lacs and above that at 8000 with highest OI of 68.12 lacs. 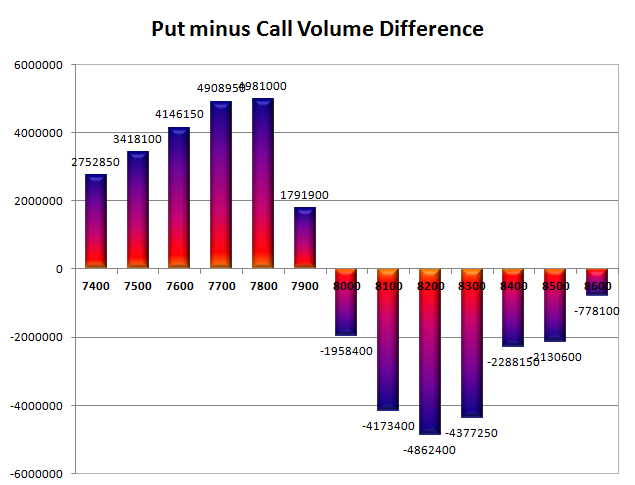 Day Range as per Option Table is 7700 - 7859 and as per VIX is 7713 - 7846 with 7774 as the Pivot. The index opened weak around 7837 but saw small buying interest to move to the highs of the day around 7894. Profit booking from thereon saw the index nosedive below 7800 and closed near the lows of the day at 7748.20, huge loss of 115.80 points. The broader market was also very weak, with just 258 advances to 1302 declines. The series range for the time being has moved down to 7700-8000. Call option 7600-8200 added huge 45.13 lacs OI with profit booking seen at 8300 and above strike prices. 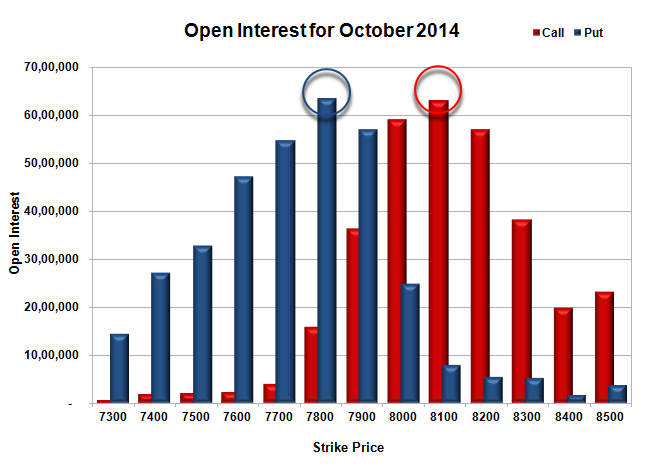 Put option 7700-7300 added huge 12.07 lacs OI with short covering seen at 7900 and above strike prices. 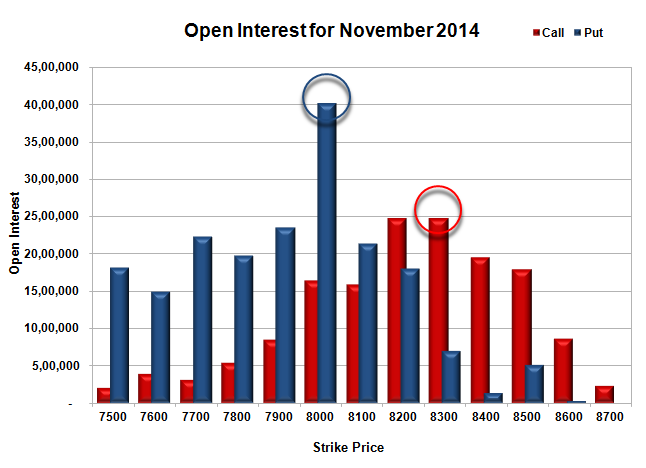 Nifty Open Interest is at 1,44,41,200 down by 2,77,600, with decrease in price, probably huge long liquidation. Bank Nifty Open Interest is at 16,07,400 down 14,500, with decrease in price, probably long liquidation. FII’s sold huge 9.21 lacs Futures, which includes 22098 contracts long liquidation and 3671 contracts short covering, with decrease in net OI by 25769 contracts (includes 45191 longs to 63618 shorts for the day) and the average price per contract comes to around 7779.30. 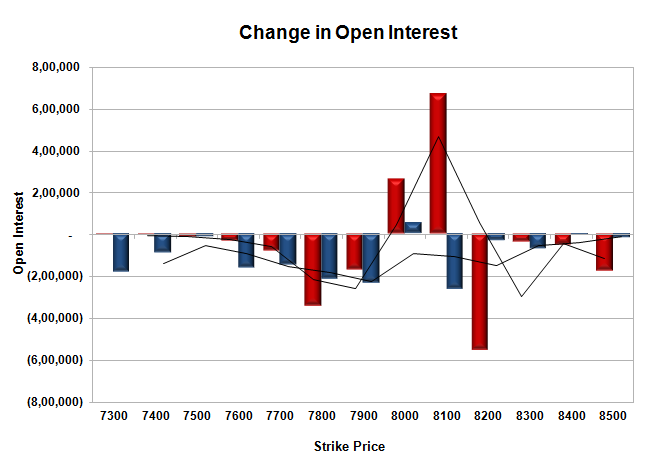 FII’s Index future open contract as on date is 153067 Longs to 72883 Shorts, net long 80184 down by 18427 contracts. 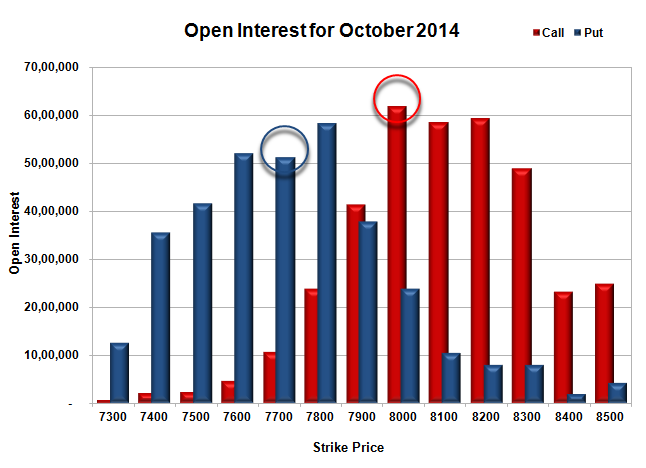 Initial and best support now at 7700, with huge OI of 51.18 lacs and below that at 7600 with OI of 52.02 lacs. 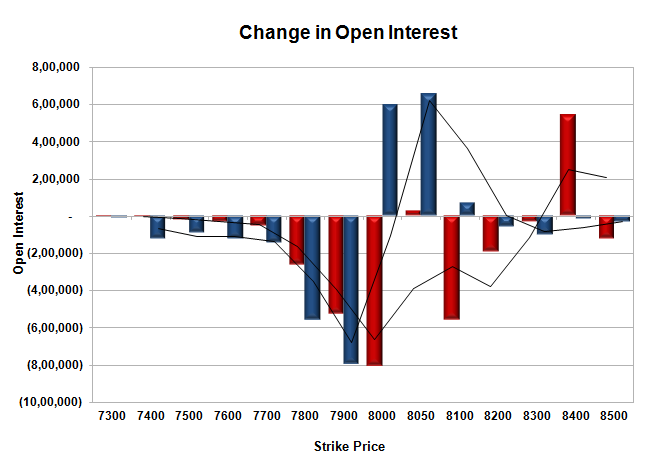 Initial resistance at 7800, with huge OI addition of 10.78 lacs and above that at 7900 with huge OI of 41.40 lacs. 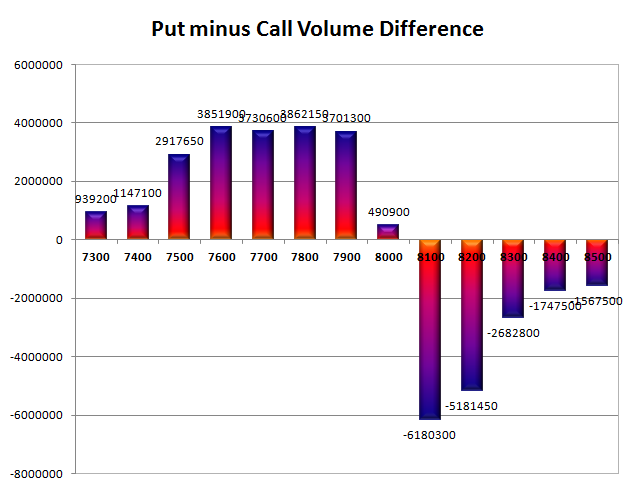 Day Range as per Option Table is 7703 - 7859 and as per VIX is 7682 - 7815 with 7791 as the Pivot. The index opened weak around 7831 and went on to touch the lows of the day at 7796. The responsive buyers took control from thereon to move the index to green and close just below 7900 at 7884.25, a gain of 24.30 points. The broader market was just positive, with 804 advances to 732 declines. The series range is at 7800-8200. Call option 7700-8200 added huge 13.92 lacs OI with profit booking seen at 8300 and above strike prices. 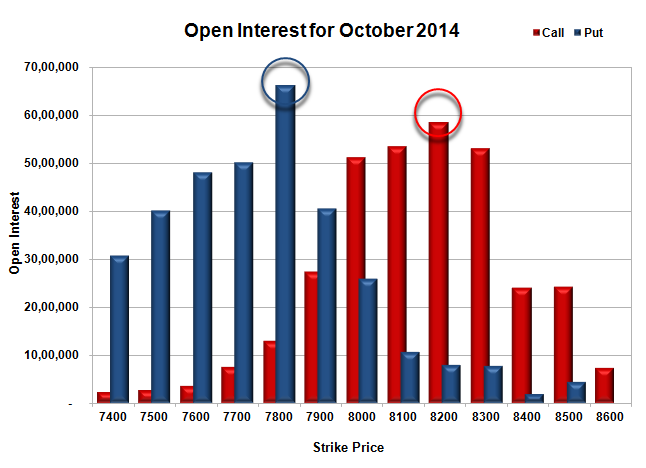 Put option 7900-7700, 7500-7400 added huge 14.97 lacs OI with short covering seen at 8000 and above strike prices. Nifty Open Interest is at 1,48,26,500 down by 6,07,550, with increase in price, probably huge long liquidation/short covering. Bank Nifty Open Interest is at 16,58,525 up 1,36,375, with increase in price, probably huge long build-up. FII’s sold huge 10.47 lacs Futures, which includes 12305 contracts long liquidation and 8638 contracts short build-up, with decrease in net OI by 3667 contracts (includes 26383 longs to 47326 shorts for the day) and the average price per contract comes to around 7901.50. 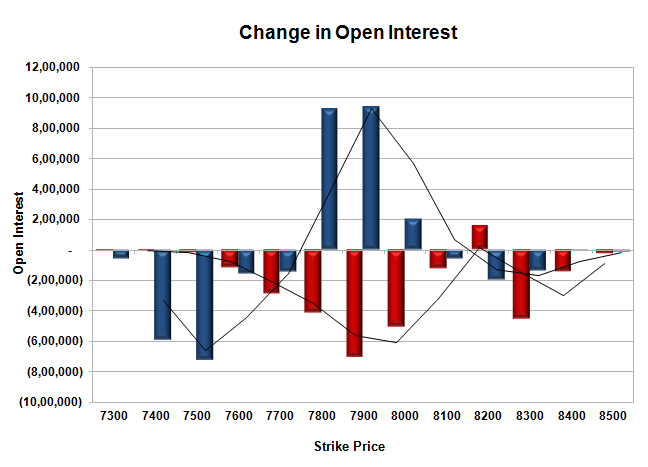 FII’s Index future open contract as on date is 183870 Longs to 77525 Shorts, net long 106345 down by 20943 contracts. Initial and best support at 7800, with highest OI of 66.97 lacs and below that at 7700 with OI of 54.68 lacs. Initial and good resistance at 8000, with huge OI of 49.62 lacs and above that at 8100 with huge OI of 52.96 lacs. 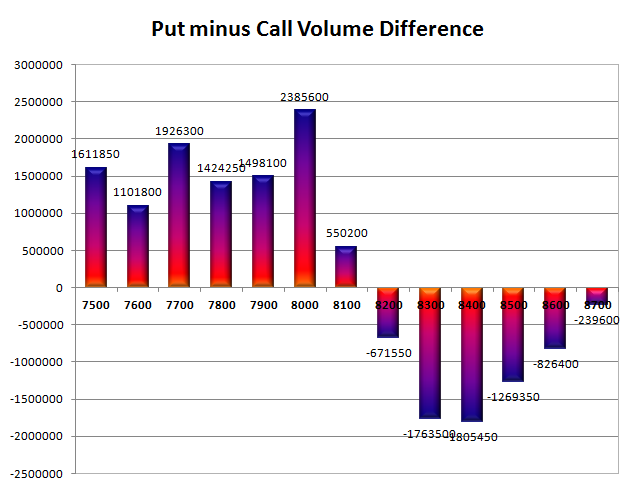 Day Range as per Option Table is 7796 - 7941 and as per VIX is 7824 - 7944 with 7860 as the Pivot. The index opened around 7911 on the back of weak global cues, and after the initial dip tried to move up only to be sold-off to the lows of the day at 7848. Nifty closed just above days low at 7859.95, a huge loss of 100.60 points. The broader market was also weak, with 397 advances to 1137 declines. The series range is at 7800-8200. Call option 7800-8400 added huge 21.68 lacs OI with profit booking seen at 8500 and above strike prices. 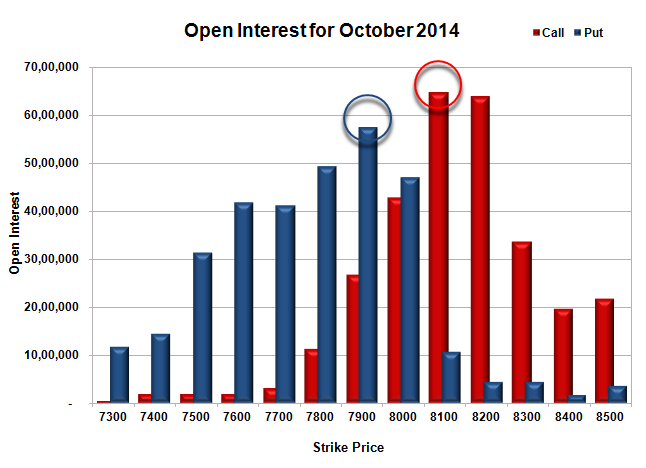 Put option 7800-7600, 7400 added huge 25.19 lacs OI with short covering seen at 7900 and above strike prices. Nifty Open Interest is at 1,54,34,050 down by 9,84,450, with decrease in price, probably huge long liquidation. Bank Nifty Open Interest is at 15,22,150 down by 59,475, with decrease in price, probably long liquidation. FII’s sold huge 18.55 lacs Futures, which includes 30632 contracts long liquidation and 6463 contracts short build-up, with decrease in net OI by 24169 contracts (includes 31949 longs to 69044 shorts for the day) and the average price per contract comes to around 7871.95. 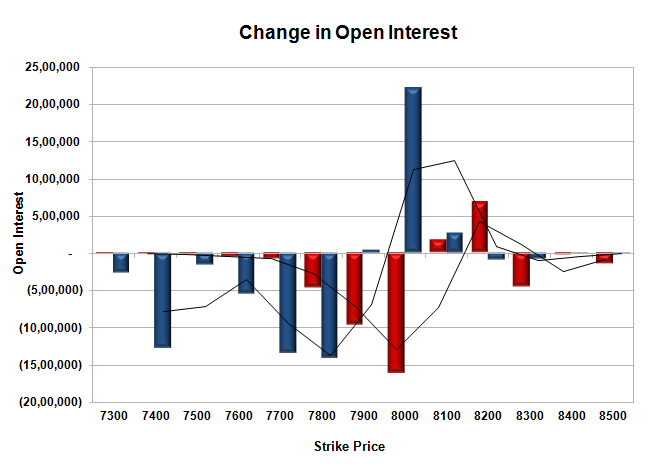 FII’s Index future open contract as on date is 196175 Longs to 68887 Shorts, net long 127288 contracts. Initial and best support at 7800, with highest OI of 59.28 lacs and below that at 7700 with OI of 54.09 lacs. 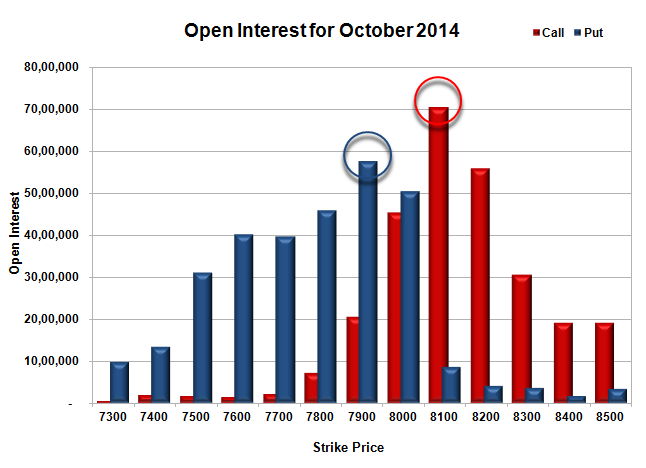 Initial resistance at 7900, with huge OI addition of 8.13 lacs and above that at 8000 with huge OI of 47.30 lacs. 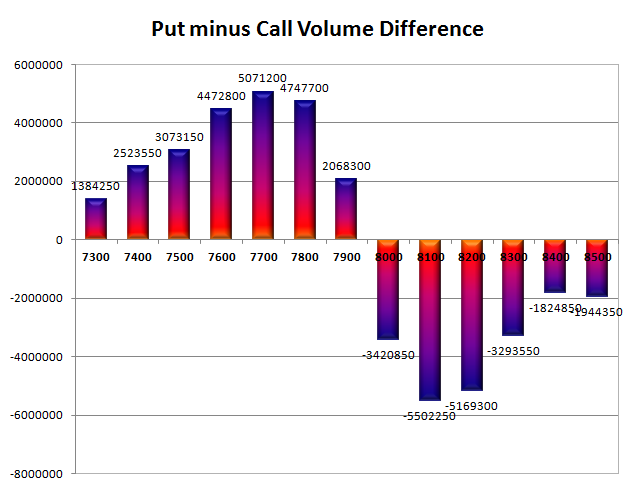 Day Range as per Option Table is 7803 - 7944 and as per VIX is 7801 - 7919 with 7877 as the Pivot.